In Old School Runescape, Sand Crabs are very popular monster to train your combat skills on. The Sand Crabs are just like Rock Crabs, although the Sand Crabs have 10 more hitpoints in comparison with Rock Crabs, which is why a lot of players prefer Sand Crabs over Rock Crabs. Sand Crabs are aggressive monsters that look like harmless sandy rocks at first, but once you get close to them they’ll start attacking you. One of the reasons why Sand Crabs are so good to train on is that you don’t need to have any requirements to travel to Sand Crabs, every player willing to put in the little effort to get to Great Kourend, where the Sand Crabs are located, can train their combat skills on them. There’s also a bank nearby which makes it easy to pick up food whenever it’s needed. Sand Crabs allow AFK training in some specific spots, with just little attention needed a player can train their combat skills. The max hit of a Sand Crab is 1, and therefore this is also a very good, if not one of the best training spots for pures or other low level defence players. Even though Sand Crabs are AFK-able, there’s a limit. 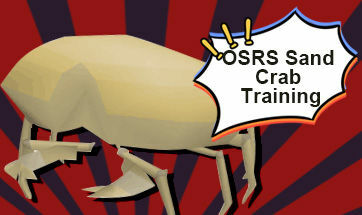 After ten minutes Sand Crabs will start becoming unaggressive, meaning that they won’t attack you anymore which eliminates the whole AFK training, but don’t worry, there’s a solution! When the Sand Crabs start becoming unaggressive after 10 minutes, you can simply run far away from them and come back to make them aggressive again. You’ll need to run away from the surroundings of the Sand Crabs, roughly the same distance as the diameter of the minimap. Traveling to Sand Crabs takes a little bit of effort, but it’s not hard or difficult at all. It’s just located in a remote place which requires a bit of traveling in order to get there. There are tons of ways to get there, but these methods require special requirements, so in this guide we’ll be using a method that everyone can use, so no requirements at all. We advise you to bring weight reducing gear, so you can travel faster and your stamina won’t run out that fast. The first step is to go to Port Sarim, which is a town in southeastern Asgarnia. You can go to Port Sarim by using the Explorer’s ring to teleport to the Cabbage patch, which is just above Port Sarim. You can also head south from Falador, southwest from Barbarian Village, head west from Al Kharid, Lumbridge, or Draynor Village. Plenty of ways to get there! Once you get to Port Sarim, you need to talk to portmaster Veos and take a ship to Great Kourend's, Piscarilius House. Once you’ve taken the ship to Great Kourend's, Piscarilius House, you need to run all the way south on the other side of the continent until you arrive at the beach where the Sand Crabs are located. Below is an image of where you should go, simply open up your minimap and go to the location pointed out on the image below, and you should be able to go there without any problems! Thanks a lot for your time. Please feel free to share this article with more people around you. RSGoldFast always shares Runescape Gameplay they may be interested in with players. 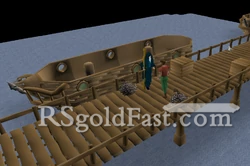 In addition, Rsgoldfast is the best place to buy RS2007 gold/Runescape 3 gold if you have demands. Have a wonderful time in Runescape.